If you are interested in any of these new brands Davidson’s has to offer please contact one of their account executives for more information at 800-367-4867. 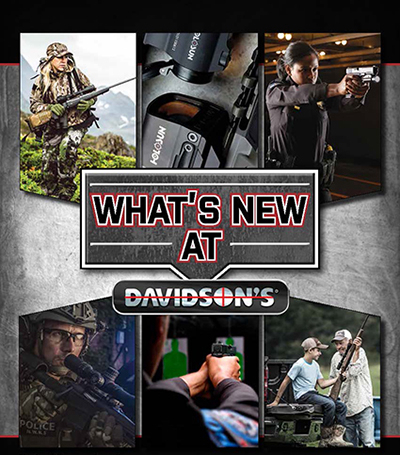 Click Here for a look at the What’s New catalog showcasing some of the newest products and brands available from Davidson’s. Founded in 1932, Davidson’s (http://www.davidsonsinc.com) is one of the nation’s leading firearms wholesalers. In late 1998, it launched the Gallery of Guns website (www.galleryofguns.com) specifically to help Davidson’s retailers sell Davidson’s inventory, it is now one of the firearm industry’s most successful consumer websites. Each firearm sold by the company is backed by the Davidson’s GuaranteeD® Lifetime Replacement Program, which extends to both the dealer and final customer. Davidson’s Vision is to be a firearms distribution company that creates, develops, and nurtures strong customer, employee, vendor and industry relationships, while always conducting ourselves honorably as we excel in the performance of our jobs and fulfillment of our corporate social responsibilities.